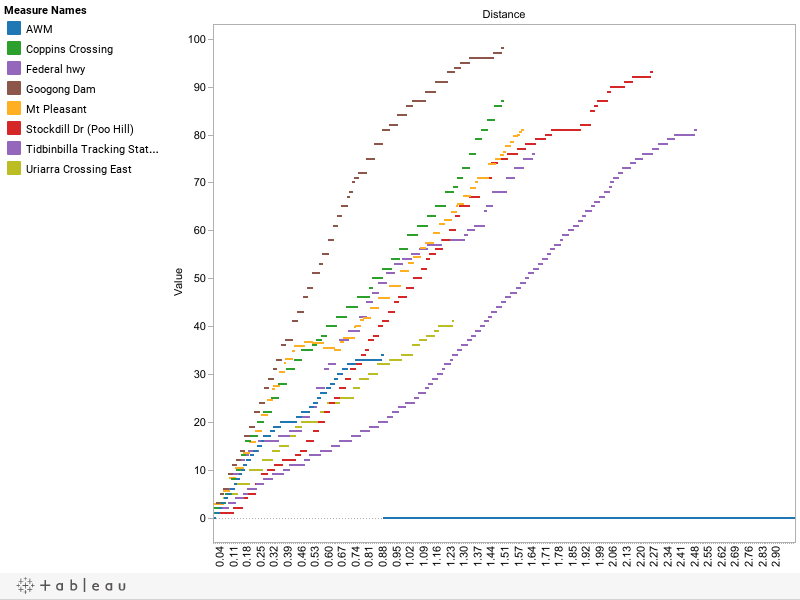 Welcome to my King of the Mountains V2.0, now with improved elevation calculations thanks to some good folk on the Vikings cycling forums I discovered how extract the data from Garmin TCX files so I could graph the actual data and not rely on the rather clumsy screen grabs. 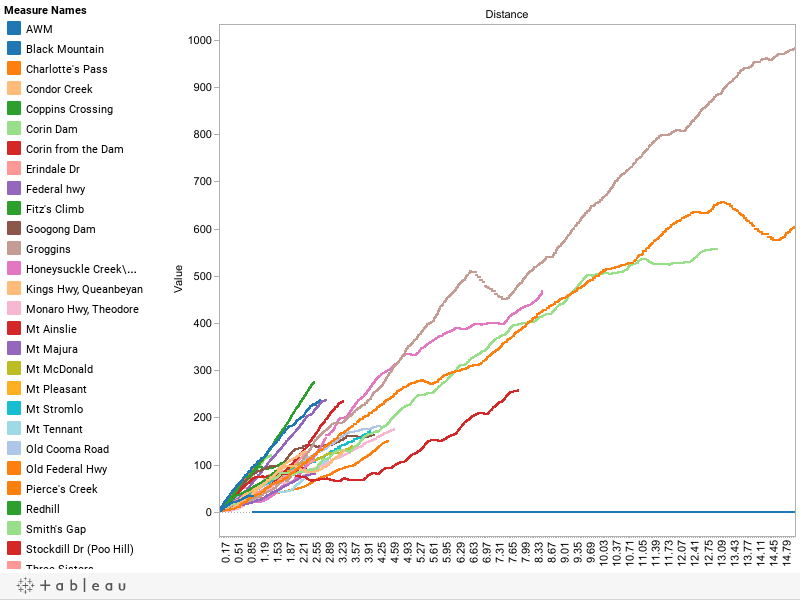 In addition I have used Tableau to graph the data, which allows you to select and compare only the climbs you are interested in. This is still a work in progress so any comment on the Tableau graphs is welcome. All the graphs can be viewed in greater detail by clicking on them which will take them to full screen mode. 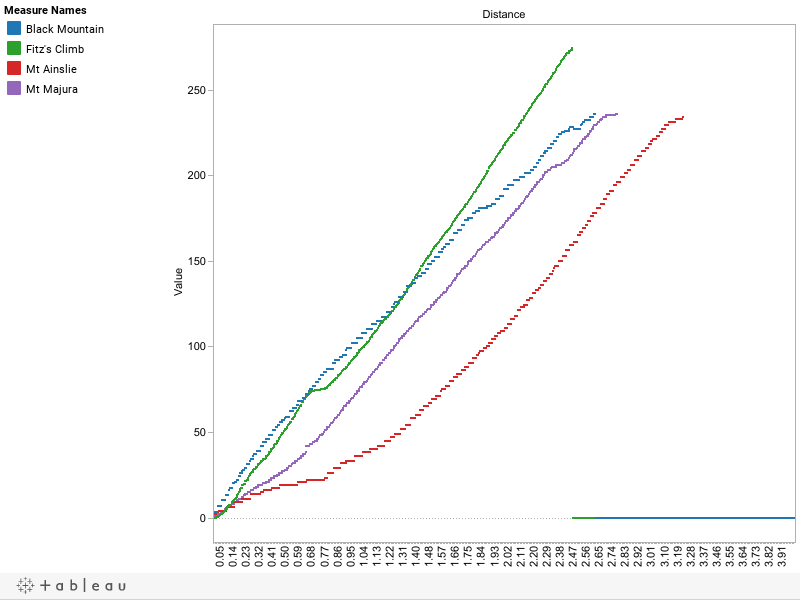 The max gradient should be taken with a bit of caution, although it was calculated from the data because of the sometimes erratic nature of the Garmin edge units some of these calculations are a little random. 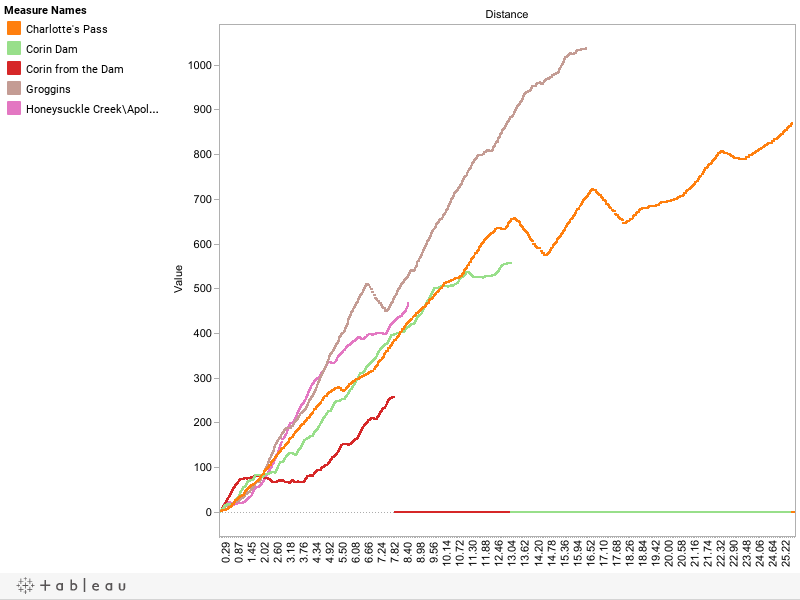 Firstly here are all the climbs on the one graph, noting that Groggins and Charlottes Pass do continue on for some distance but I’ve cut them short here to ensure you can still make out the other climbs. Cat X– The big ones to really test you. Corin Dam – This climb has two distinct parts. The first starts at the turn off to Corin Dam on Paddy River road up to the gates at Woods Reserve. The first part of the ride is easy with fairly low gradient. From the gates to summit the ride gets harder as gradient increases and is what makes Corin a really good climb. Honeysuckle Creek – Also known as Apollo Rd South of Tharwa. The start of this climb was measured from the bridge about 2km from the Nass rd / Apollo rd junction. This is one of hardest rides in Canberra in my opinion with some short sections hitting a 20% gradient. Groggins and Charlotte’s Pass – are both located South of Canberra in the ski fields around Thredbo. The data for these climbs was given to me so I can’t comment on the climbs but I hope one day to get there. The Charlottes Pass ride goes on for 32km and there is a bit more of a climb but by the 25k mark you’ll have broken the back of this climb. Cat A – Represent some of the “bigger” challenges around Canberra, these are usually the ones with the killer gradients. Black Mountain (Telstra Tower) – The climb was measured from the turn off to the very top of the summit, past the car park entry where a lot of riders usually stop their timers. Black Mountain in my opinion along with Fitz’s Hill represents one of harder climbs in Canberra. What makes it difficult is the first 400 metres, which has quite a hard gradient of around 15%. Mount Ainslie – Preceding the climb to Mount Ainslie is the climb at the Australian War Memorial which adds another 34 metres to the climb. Mount Majura – Our famous secret climb. This was measured from the turn off on Majura Road, not bad considering there is a additional 81 metre up Federal Hwy (See the Cat C Climbs) before you get there. At about 600m there is an entry gate you’ll have climb over to continue the climb. Cat B – These represent good training climbs (well for me at least) that wont leave your legs screaming when you reach to the summit. Red Hill – Measured from the turn off to Red Hill. Reported gradient on the chart above probably doesn’t do Red Hill justice. In measuring the distance I measured to the summit which is at the restaurant but you can see from the image above the climb plateaus at around 1.1 km where the main lookout is. If measure the gradient to this part of the climb it comes out at around 9%, on par with Black Mountain, just shorter. Maybe not one of the beginner hills. The Three Sisters – This is the climb out of Uriarra crossing heading back to Mt Stromlo. Measured from the bridge crossing to the KOM marking on the road. So called because of the three distinctive sections to this ride. Always fun at the end of a race, which happens frequently. Mt McDonald – Located on the other side of cotter and goes up around cotter dam. Measured from the turn off on Cotter Road to the KOM marking on the road. Good training ride, not difficult, just a good consistent gradient. Mt Stromlo – Measured from the turn off on Cotter Rd to very summit which means going up the small road which is in average condition near the new observatory. What I like about Mt Stomlo is the even gradient for the climb. Nothing challenging but a can be a good workout if you choose to push yourself. Pierce’s Creek – This is the first climb after Cotter Dam on Paddy River Road on the way out to the tracking station. At 9% it is a toughy but relatively short. Monaro Hwy, Theodore – This is climb as you leave Canberra on the way to Cooma. Nothing spectacular about this climb other than it has consistent gradient. Old Cooma Road – Good climb with some steep sections on it. This road can get some traffic with the trucks going to the quarry. Erindale Road – You’ll note the graph for this one appears quite “grainy” compared to the others. This is because it was actually mapped going down the hill and the higher speed meant there were less data points to graph. Wallaroo – Good solid climb with some steep sections in it. Kings Hwy, Queanbeyan – only advice here is get in quick if you want to do this one, they are currently redoing this section of the Kings hwy and it will be shorter and lower soon. Cat C – I guess these can be classed as the beginner climbs but should not be underestimated. Australian War Memorial (AWM) – Normally I don’t map climbs this small but as this is the lead into Mt Ainslie I thought it was good to have here. It’s s short climb but does peak at 8% and is a nice way to way to warm up before the big climb to Mt Ainslie. Mt Pleasant - Measured from the turn off on Fairbairn Ave into Duntroon. One of my favourite training rides. Starts of with a kick on the first section but then evens out to consistent climb. Coppins Crossing – Measured from the crossing to the summit. Federal Hwy, Watson – Starting from the last roundabout leaving Canberra, starts of easy, nice consistent gradient, smooth road. Importantly this is the lead up to the Mt Majura climb. Stockdill Drv (Poo Hill) – so named because it is the road leading to the Sewage plant, the smell alone should be enough of an incentive to do this climb quickly. Uriarra Crossing West– This is the climb opposite to the 3 sisters at Uriarra Crossing. It is a little below par but given it is part of the Uriarra loop, it a frequent climb and therefore people might like to know about it. Tidbinbilla – On the road to the tracking station. Not to hard unless it is on the finish to a race at the tracking station. An interesting point came up while preparing the data for this post. 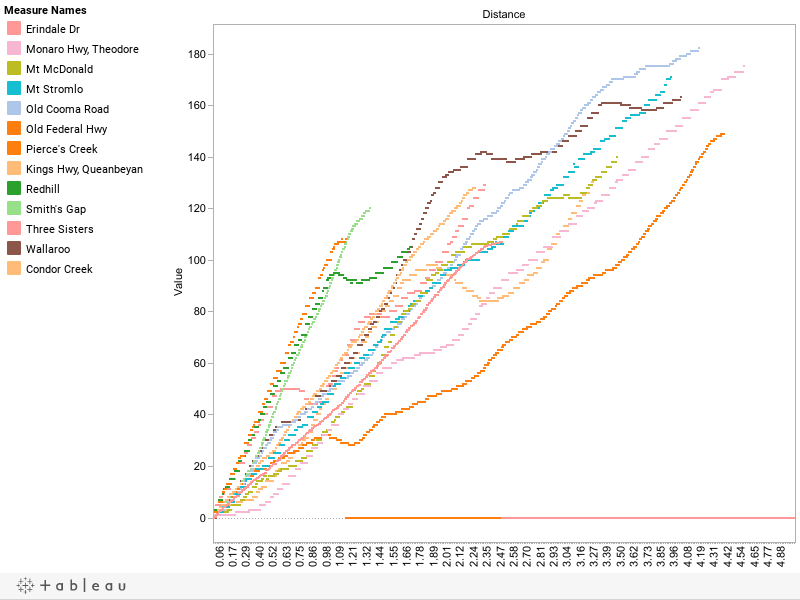 You’ll notice that on some of the climbs the data points are a lot closer than others. For example in the Cat C climbs Urriarra West compared to most of the others. The difference can be attributed to the use of the new Garmin Edge 500 which appears to record data points more frequently than the 705. I guess this one of those less obvious feature improvements you get with the 500. It should also be noted that while Garmin say their devices are accurate I have found on given day I can get up to a 10% variation on the reading for the climbs so if you’ve recorded these climbs as well but have a different elevation just bear this in mind. In fact you’ll notice with my Corin and Mt Majura recordings there are some odd spikes in the data which I just put down to these glitches. For those interested I’m planning to write a follow up article on how I extracted and manipulated the data. If there are any other climbs that should be included please let me know. Great site, thanks for the info and time invested. Keep up the good work! Good work, Mark. Fairlight Rd and also East Tallaganda Lane are two others you may consider. Agree with Ross, East Tallaganda Lane riding in an anticlockwise direction has a nice little hill about 1 km from the Sutton to Gundaroo road turn off. Then a short climb toward the end of the Lane near the Mulligans Flat road. Thanks for this work. Stumbled upon it accidentally the other week, and it inspired me to hire a bike when I was in Canberra earlier this week with a few spare hours between meetings. I would have liked to do some of the more far-flung rides you have described, but in the end time constraints meant that I could only do Black Mountain, Mount Ainslie, Red Hill, and the roads and cycleways between those. Black Mountain was perhaps the quintessential Canberra winter experience- pouring rain and 7 degrees. By contrast the next morning Mount Ainslie was glorious a little after 6.00am (having had a kangaroo keep me company for a short distance) watching the dawn before riding to Red Hill. Mount Ainslie is a challenging hill doing it for the first time, as it keeps getting steeper as you go up. Coming up to a left hander half way up I was sure it would flatten off a little as so many hills do but no, it just got steeper! thanks for the great info – well done. Another one to add would be Mountain Creek Road out of Cavan/Taemas Bridge – I think it’d be third biggest in elevation behind Corin and Apollo. Nice climb! Mountain Vale Road out at Nanima is another one. What about the climb up Macs Reef Road – heading towards Bundgendore road ….. from Bankers Road to Newington road or thereabouts ? I just wondering why fitz hill is only in the graph. cause to me so far is too daunting to climb. so we know the gradient as well.